← More than the sand.. 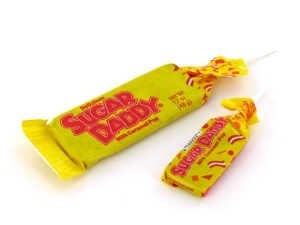 He ain’t your sugar daddy. I think we give God different job descriptions depending on our current situations. When we’re in trouble and faced with a catastrophe, we expect Him to be our 911 to the rescue flying down the road with lights and sirens blazing. When we’re sick, He’s our Dr. Oz. When we’ve come to the realization we’re a hot mess and no one can fix our hypochondria, depression, ADD, anxiety, addictions, family drama, and low self-esteem, He’s our Dr. Phil on steroids. We get so focused on getting a “get out of jail free” card, we neglect the issues that landed us the cold bed with the bars and metal toilet. Let me share something with you that’s rather profound. You ready for this? Baby, God ain’t your sugar daddy. He ain’t arm candy you can pick up and wear when you so choose. He’s the holy, sovereign, perfect, endless, majestic God and Creator of the universe. And you know what? He wants to know how your day went. He wants you to kick back at the end of the day and chat it up with Him. He’s never bored by you. He wants to be your friend. YOURS. Pretty humbling, isn’t it? My intention isn’t to beat you brutally over the head with a cast iron frying pan like Rapunzel did Flynn Ryder from Tangled, but to simply shift your focus. We so desperately need this shift of focus if we desire to have a real relationship with God. Shoot, if all our “relationship”consisted of were calls and texts asking for things and favors, heck I would have probably changed my number and moved on a long time ago. A relationship takes work. And time. Acceptance. Grace. Lots of soap and water for the big screw ups. And definitely communication. There’s no way to maintain a healthy relationship with someone when you’re only going to them out of needs and necessities. The beauty is found when it becomes mutual love and adoration. When you meet in the middle and two become one. It reminds me of how we are called the bride of Christ. Just like in a wedding ceremony, the bride and groom walk into it as two separate people. But after they enter into holy matrimony, the bible says they are one flesh. If their love is true and pure, they meet in the middle and cannot be separated. It can’t be 90/10. We have to meet in the middle. 50/50. God has already done His part. He’s loved us and adored us since long before those darling little cries were heard in the delivery room. It says in Jeremiah 1:5 that He knew us before we were formed in our mothers womb. Zephaniah 3:17 says he rejoices over us with singing. He’s been calling your name. He’s been waiting for you to open up your eyes and realize how messed up you are and how much He still wants to wrap His arms around you and love you. But know He’ll work on you. He loves you the way you are but refuses to let you stay that way. God is so good, but it is so easy to take advantage of his grace. Don’t be a grace hog. Come to Him with thanksgiving and a grateful heart. It’s time to crush that sugar-daddy-Santa-clause-genie-in-a-bottle mentality. Stop thinking He owes you something. He’s God. He loves you and is willing to spare you from the pits of hell if you surrender your life and accept Him. What more can you ask for? Posted on July 23, 2013, in Can I vent? and tagged God, sugar daddy. Bookmark the permalink. Leave a comment.